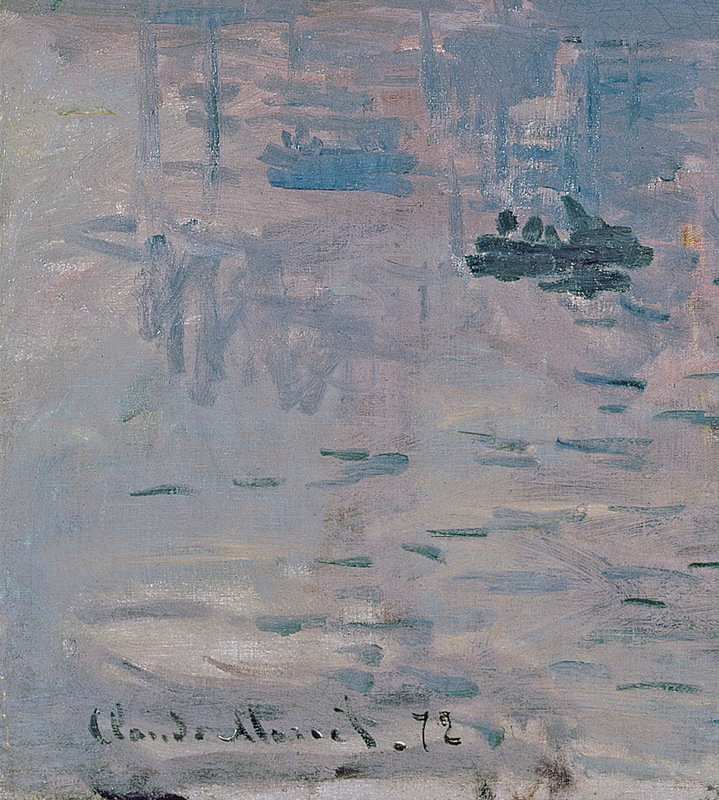 In 1845, when his family moved to Le Havre, Claude Monet was five. Le Havre was where he acquired his training, painted his first pictures and had his first work exhibited, in 1858 - a landscape painted in Rouelles, in the company of Eugène Boudin. He left the city in 1859 to go and study in Paris, but frequently came back to see his family. In the course of the 1860s, he painted nearly 30 pictures in Le Havre and Sainte-Adresse, all of the beach, the regattas and the jetty. In 1870-1871, he took refuge from the Franco-Prussian War in London, where he was fascinated by the large modern harbour and discovered the works of Turner in the National Gallery. After his return to France, Monet's visits to Le Havre were occasional. He was now chiefly interested in the harbour. He painted several pictures of it between 1872 and 1874, including Impression: Sunrise. In 1874, this picture was included in the exhibition held by the Société anonyme des peintres, graveurs, sculpteurs in the photographer Nadar's Paris studio. 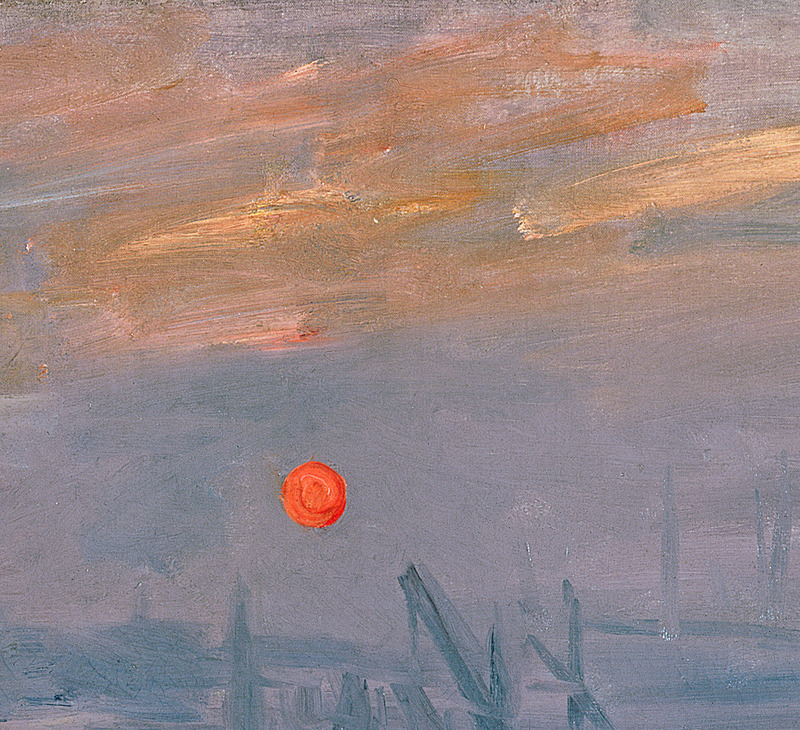 When pressed to give the work a name, Monet came up with “Impression: Sunrise”. On the basis of this title, Louis Leroy, a critic on the satirical magazine Le Charivari, coined the term “Impressionist” for the small group of artists who gravitated round Monet - and the name stuck. Yet the “impression” Monet said could not pass muster for a view of Le Havre clearly depicts an actual place. The artist set up his easel in a bedroom in the Hôtel de l’Amirauté on the Grand Quai (now the Quai de Southampton), from which he could look down on the outer harbour. That early morning, he turned eastwards and painted the activity in the harbour. The Quai au Bois and the Bassin de la Citadelle can be made out in the mist on the left, the open lock-gates of the Écluse des Transatlantiques can be seen in the centre, and the curved quay of the Bassin de Floride is visible on the right. Monet painted a real industrial setting. 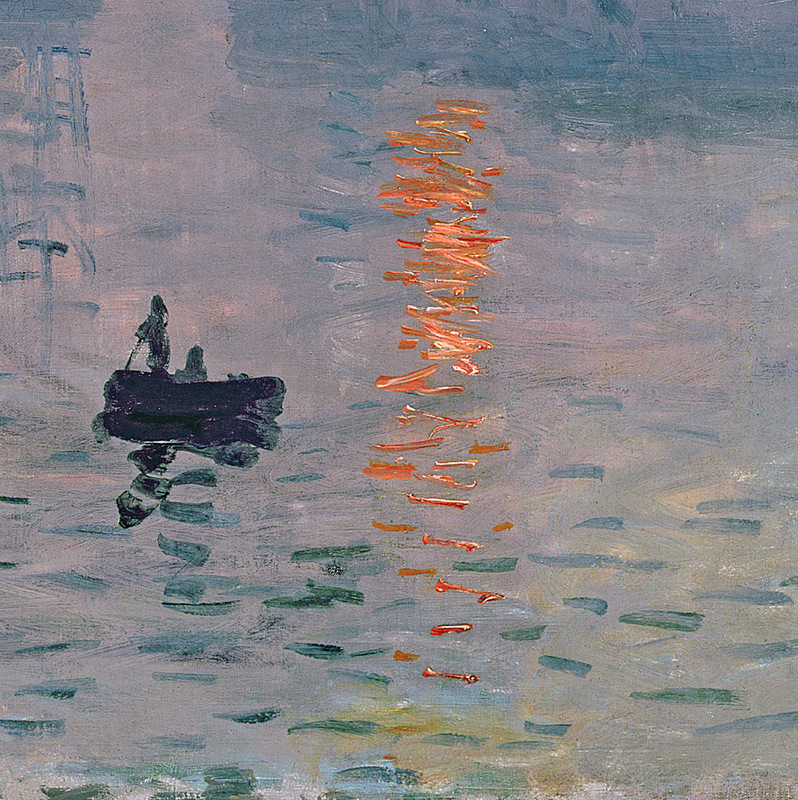 In addition to this unacademic choice of subject, which demonstrated an interest in the modern world that was new, with this painting, Monet set himself the considerable challenge of capturing a fleeting impression of something intrinsically transient - the moment when the sun first appears in the sky and begins its ascent, while the sky rapidly changes colour. To try and render what he saw as accurately as possible, Monet worked fast, producing the painting in perhaps one or two sessions. To capture a fleeting phenomenon, he would paint fast and furiously to try to achieve an “aesthetic correspondence between the time represented and the time taken to represent it”. Impression: Sunrise became famous belatedly, in the twentieth century. The work has come to epitomise modern art. But Monet's explorations of light did not stop in 1874. In the early 1890s, they led him to paint series. He abandoned “fast painting”, instead seeking to render what he called “instantaneity, in particular the envelope, the same light spread over everything”. 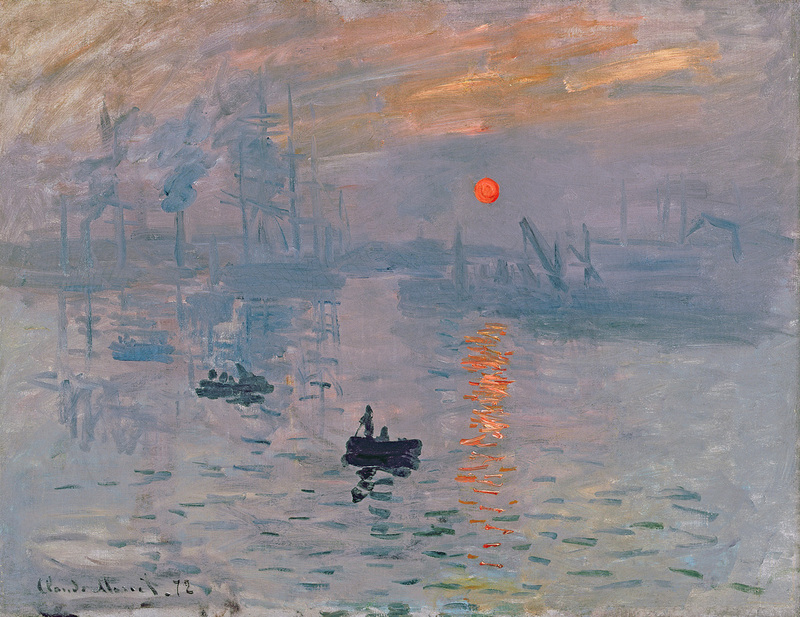 To illustrate this line of development, two other Monets from MuMa's collections are displayed alongside Impression: Sunrise. The first, Winter Sun, Lavacourt, dates from the late 1870s and was bequeathed to the museum by the local collector Charles-Auguste Marande. 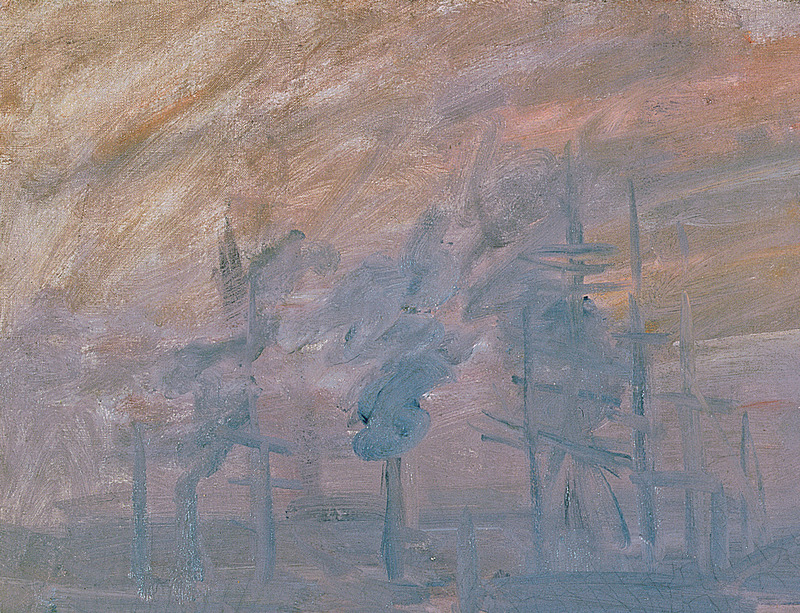 The second, Houses of Parliament, Fog Effect, dates from 1903 and was donated by Monet himself to Le Havre Museum in 1910, along with two other pictures. Both depict a landscape at sunset. Like Impression: Sunrise, they show a specific location, be it bucolic or urban, and the fleeting moment when night turns to day or day to night. Winter Sun, Lavacourt, produced several years after Impression, comes from Monet’s “fast painting” period, but Houses of Parliament belongs to the new cycles begun in the 1890s, the “series” (Haystacks, etc.). To render the endless variations in light, Monet now worked on several pictures at once over long periods, sometimes returning to them years later, as with MuMa's Houses of Parliament, which was begun in the open air in London in 1900 (the framework of the picture bears the mark of a London firm) and was finished at Giverny in 1903. Whereas Lavacourt shows signs of having been painted fast from life (for instance, the canvas has been left bare in places), Houses of Parliament has a smooth, almost glazed surface, and its treatment is extremely subtle. Houses of Parliament was shown in Paris in 1904, along with 36 other paintings from the London series, in the hugely successful exhibition “Monet. Views of the Thames in London” at Durand-Ruel’s gallery.